An Add-on Domain is an extra domain that any person can make if he already owns a Domain. It is mainly used when a Domain owner wishes to manage multiple domains from a single control panel and a single hosting plan. It is a money saving process. An add-on domain can be given an add-on domain email address, forwarders and more, just like in a primary domain on the account. Here, simply one control panel is used to manage multiple hosting packages. 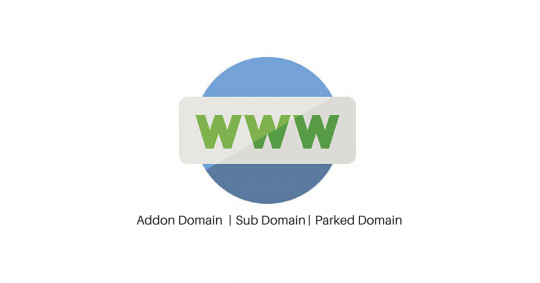 The add-on domain appears completely separate from the primary domain. As a result of which the incoming traffic will have no evidence that the domain they are visiting is an add-on domain. Log into your control panel. Expand the left-hand stats pane, if not expanded already. Here you can see all the add-on domains you currently have. It also shows the maximum number of Add-on Domains you can have. 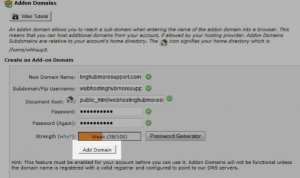 Step 1: Select “Add-on Domain” under the section “Domains”. Step 2: Fill the details of the Add-on Domain. When finished, click on the Add Domain button. You now have a new Add-on Domain. The domain begins working on the server after some time delay, called Propagation time. ◈ A new folder is created in the public_html Directory. ◈ A new Subdomain is created for the previously owned primary domain and is attached to the new folder in the public_html Directory. ◈ The new domain name is always associated with the Subdomain created in the previous step. All three URL’s would show the same website and access the same directory. However, any visitor that accesses 1234.com would have no clue that he was routed through 1234.want2host.com and all the functions would run normally. All these things happen automatically. No further actions are needed once you have loaded the content into the Addon Domain folder. The website want2host.com route can also be disabled without disturbing the 1234.com route. This is known as restricting Subdomain access to Add-on Domains. Additionally, when dealing with a shared hosting plan, a single control panel would have to manage all the multiple hosts. This could become a problem. However, you can create a unique control panel for each domain name using a reseller plan. This means that the second domain owner can also manage and login into the email accounts, without needing access to the main control panel. Step 1: Click on the Add-on Domains icon in the Control Panel. Step 2: Scroll down and find the list of Add-on Domains. Step 3: Locate the Add-on Domain you want to delete. Select Remove next to the Add-on Domain to remove it. Manage Redirection Link can be used to redirect your Add-on Domain to some other URL if required.